While employees eagerly look forward to booking their vacations, employers typically dread the confusion and chaos that arises due to scheduling conflicts. Furthermore, it's vital for organizational profitability to ensure that key employees are available during crucial times of the year. Fortunately, our full color Vacation Scheduler is the perfect way to keep employee vacations organized, while also keeping employers stress-free and organizations strong. 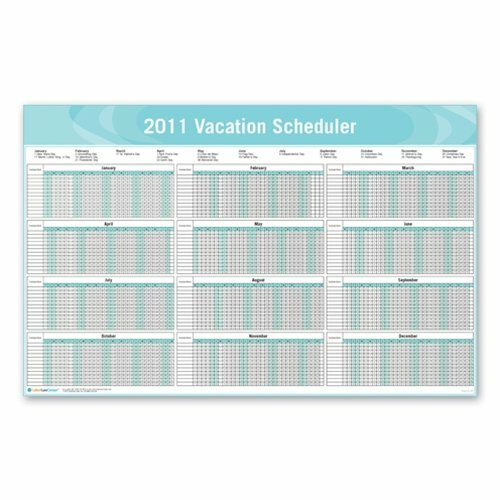 Available in attractive blue, green or red, the roomy 28" x 18" Vacation Scheduler provides a visual of each month with all the days on one row, which is ideal for planning vacations and avoiding conflicts at a single glance. The Vacation Scheduler is also laminated on both sides for years of lasting use.